For other uses, see Girl with a Pearl Earring (disambiguation). The painting is a tronie, the Dutch 17th-century description of a 'head' that was not meant to be a portrait. It depicts a European girl wearing an exotic dress, an oriental turban, and an improbably large pearl earring. In 2014, Dutch astrophysicist Vincent Icke [nl] raised doubts about the material of the earring and argued that it looks more like polished tin than pearl on the grounds of the specular reflection, the pear shape and the large size of the earring. The work is oil on canvas and is 44.5 cm (17.5 in) high and 39 cm (15 in) wide. It is signed "IVMeer" but not dated. It is estimated to have been painted around 1665. After the most recent restoration of the painting in 1994, the subtle colour scheme and the intimacy of the girl's gaze toward the viewer have been greatly enhanced. During the restoration, it was discovered that the dark background, today somewhat mottled, was initially intended by the painter to be a deep enamel-like green. This effect was produced by applying a thin transparent layer of paint, called a glaze, over the present-day black background. However, the two organic pigments of the green glaze, indigo and weld, have faded. On the advice of Victor de Stuers, who for years tried to prevent Vermeer's rare works from being sold to parties abroad, Arnoldus Andries des Tombe purchased the work at an auction in The Hague in 1881, for only two guilders with a thirty cents buyer's premium (around €24 at current purchasing power). At the time, it was in poor condition. Des Tombe had no heirs and donated this and other paintings to the Mauritshuis in 1902. The painting was exhibited as part of a Vermeer show at the National Gallery of Art in Washington, D.C., in 1965 and 1966. In 2012, as part of a traveling exhibition while the Mauritshuis was being renovated and expanded, the painting was exhibited in Japan at the National Museum of Western Art, Tokyo, and in 2013–2014 the United States, where it was shown at the High Museum in Atlanta, the de Young Museum in San Francisco and in New York City at the Frick Collection. Later in 2014 it was exhibited in Bologna, Italy. 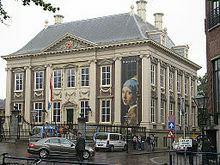 In June 2014, it returned to the Mauritshuis museum which stated that the painting would not leave the museum in the future. The painting was investigated by the scientists of the Netherlands Institute for Cultural Heritage and FOM Institute for Atomic and Molecular Physics (AMOLF) Amsterdam. The ground is dense and yellowish in color and is composed of chalk, lead white, ochre and very little black. The dark background of the painting contains bone black, weld (luteolin, reseda luteola), chalk, small amounts of red ochre, and indigo. The face and draperies were painted mainly using ochres, natural ultramarine, bone black, charcoal black and lead white. In February-March 2018 an international team of art experts spent two weeks studying the painting in a specially constructed glass workshop in the museum, open to observation by the public. The non-invasive research project included removing the work from its frame for study with microscopes, X-ray equipment and a special scanner to learn more about the methods and materials used by Vermeer. The painting has gone under a number of titles in various countries over the centuries. Originally it may have been one of the two tronies “painted in the Turkish fashion” (Twee tronijnen geschildert op sijn Turx) recorded in the inventory at the time of Vermeer’s death. It may later have been the work appearing in the catalogue to a 1696 sale of painting in Amsterdam, where it is described as a "Portrait in Antique Costume, uncommonly artistic" (Een Tronie in Antique Klederen, ongemeen konstig). After the bequest to the Mauritshuis, the painting became known as "Girl with a Turban"" (Meisje met tulband) and it was noted of its original description in the 1675 inventory that the turban had become a fashion accessory of some fascination during the period of European wars against the Turk. But in 1995 the title "Girl with a Pearl" (Meisje met de parel) was considered more appropriate. Pearls, in fact, figure in twenty-one of Vermeer’s pictures, including very prominently in "Woman with a Pearl Necklace". Earrings alone are also featured in "A Lady Writing a Letter", "Study of a Young Woman", "Girl with a Red Hat" and "Girl with a Flute". 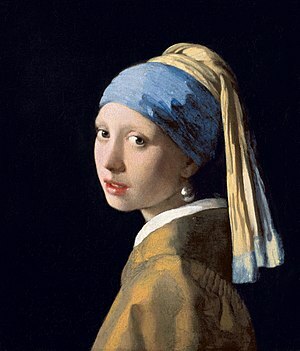 Similarly shaped ear-pieces were used as convincing accessories in 20th-century fakes that were briefly attributed to Vermeer, such as "Young Woman with a Blue Hat", "Smiling Girl" and "The Lace Maker". Generally the English title of the painting was simply “Head of a Young Girl”, although it was sometimes known as "The Pearl". One critic explained that this name was given, not just from the detail of the earring, but because the figure glows with an inner radiance against the dark background. Some of the first literary treatments of the painting were in poems. For Yann Lovelock in his sestina, "Vermeer’s Head of a Girl", it is the occasion for exploring the interplay between imagined beauty interpreted on canvas and living experience. W. S. Di Piero reimagined how the "Girl with Pearl Earring by Johannes Vermeer" might look in the modern setting of Haight Street in San Francisco, while Marilyn Chandler McEntyre commented on the girl's private, self-possessed personality. There have also been two fictional appearances. As La ragazza col turbante (Girl with a Turban, 1986), it features as the general title of Marta Morazzoni’s collection of five short novellas set in the Baroque era. In the course of the title story, a Dutch art dealer sells Vermeer’s painting to an eccentric Dane in the year 1658. Indifferent to women in real life, the two men can only respond to the idealisation of the feminine in art. In the following decade, Tracy Chevalier's 1999 historical novel Girl with a Pearl Earring fictionalized the circumstances of the painting's creation. There, Vermeer becomes close to a servant whom he uses as an assistant and has sit for him as a model while wearing his wife's earrings. The Girl with a Pierced Eardrum, a parody of the painting, created by Banksy on a wall in Bristol. The novel later inspired the 2003 film and 2008 play of the same name. The painting also appeared in the 2007 film St Trinian's, when a group of unruly schoolgirls steal it to raise funds to save their school. Fellow artists went on to put Vermeer’s painting to iconic use in the 21st century. Ethiopian American Awol Erizku recreated the painting as a print in 2009, centering a young black woman and replacing the pearl earring with bamboo earrings as a commentary on the lack of black figures in museums and galleries. His piece is titled "Girl with a Bamboo Earring". And in 2014, the English street artist Banksy reproduced the painting as a mural in Bristol, incorporating an alarm box in place of the pearl earring and calling the artwork "Girl with a Pierced Eardrum". ^ a b Girl with a Pearl Earring, Mauritshuis. Retrieved on 8 December 2014. ^ (in Dutch) Meisje met de parel, Mauritshuis. Retrieved on 8 December 2014. ^ a b Pieters, Janene (February 1, 2018). ""Girl with a Pearl Earring" to be scanned, analyzed in public view". NLTimes. Retrieved March 20, 2018. ^ (in Dutch) Joris Janssen, "Curieuze ontdekking: Meisje met de parel heeft geen parel", New Scientist, 2014. Retrieved on 8 December 2014. ^ Details: Johannes Vermeer, Girl with a Pearl Earring, c. 1665, Mauritshuis. Retrieved on 9 December 2014. ^ "Value of the guilder / euro". www.iisg.nl. Retrieved 2015-10-06. ^ Vermeer, Rembrandt, and Hals: Masterpieces of Dutch Painting from the Mauritshuis, Frick Collection. ^ Lestienne, Cécile. "Grounded: the great art treasures that no longer go out on the road". the Guardian. Retrieved 2015-10-06. ^ Groen, Karin M; Van der Werf, I. D.; van den Berg, K. J.; Boon, J. J. (January 1, 1998). "The Scientific Examination of Vermeer's Girl with a Pearl Earring, in Gaskell, I. and Jonker, M., Vermeer Studies, in Studies in the History of Art, 55, National Gallery of Art, Washington 1998, pp. 169-183". Retrieved February 2, 2018. ^ Vermeer, Girl with a Pearl Earring, illustrated pigment analysis at ColourLex. ^ "The secrets of Girl with a Pearl Earring". BBC. 14 March 2018. Retrieved 20 March 2018. ^ Mark Jenkins, "St. Trinian's Girls Aren't As Bad As They Wanna Be", NPR, 2009. Retrieved on 9 December 2014. ^ "New Banksy 'earring' mural appears in Bristol Harbourside – BBC News". Retrieved 2015-10-06. Liedtke, Walter A (2001). Vermeer and the Delft School. Metropolitan Museum of Art. ISBN 9780870999734. OCLC 893698712. Wikimedia Commons has media related to Girl with a Pearl Earring by Johannes Vermeer.